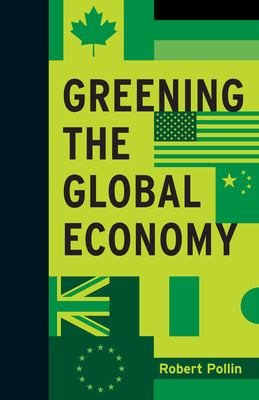 Greening the Global Economy (Boston Review Books) (Hardcover) | Copperfield’s Books Inc. Achieving the target goals will be highly challenging. Yet in Greening the Global Economy, economist Robert Pollin shows that they are attainable through steady, large-scale investments--totaling about 1.5 percent of global GDP on an annual basis--in both energy efficiency and clean renewable energy sources. Not only that: Pollin argues that with the right investments, these efforts will expand employment and drive economic growth. Robert Pollin is Professor of Economics and Codirector of the Political Economy Research Institute at the University of Massachusetts, Amherst. He has served as a consultant on energy and the economy for a wide range of organizations and institutions, including the U.S. Department of Energy, the International Labour Organization, the United Nations Industrial Development Program (UNIDO), and numerous non-governmental organizations. He is author of Back to Full Employment (MIT Press), also in the Boston Review series, and Contours of Descent: U.S. Economic Fractures and the Landscape of Austerity.